We conducted a systematic review and meta-analysis to clarify the risk of early and late cardiotoxicity of anthracycline agents in patients treated for breast or ovarian cancer, lymphoma, myeloma or sarcoma. Randomized controlled trials were sought using comprehensive searches of electronic databases in June 2008. Reference lists of retrieved articles were also scanned for additional articles. Outcomes investigated were early or late clinical and sub-clinical cardiotoxicity. Trial quality was assessed, and data were pooled through meta-analysis where appropriate. Fifty-five published RCTs were included; the majority were on women with advanced breast cancer. A significantly greater risk of clinical cardiotoxicity was found with anthracycline compared with non-anthracycline regimens (OR 5.43 95% confidence interval: 2.34, 12.62), anthracycline versus mitoxantrone (OR 2.88 95% confidence interval: 1.29, 6.44), and bolus versus continuous anthracycline infusions (OR 4.13 95% confidence interval: 1.75, 9.72). Risk of clinical cardiotoxicity was significantly lower with epirubicin versus doxorubicin (OR 0.39 95% confidence interval: 0.20, 0.78), liposomal versus non-liposomal doxorubicin (OR 0.18 95% confidence interval: 0.08, 0.38) and with a concomitant cardioprotective agent (OR 0.21 95% confidence interval: 0.13, 0.33). No statistical heterogeneity was found for these pooled analyses. A similar pattern of results were found for subclinical cardiotoxicity; with risk significantly greater with anthracycline containing regimens and bolus administration; and significantly lower risk with epirubicin, liposomal doxorubicin versus doxorubicin but not epirubicin, and with concomitant use of a cardioprotective agent. Low to moderate statistical heterogeneity was found for two of the five pooled analyses, perhaps due to the different criteria used for reduction in Left Ventricular Ejection Fraction. Meta-analyses of any cardiotoxicity (clinical and subclinical) showed moderate to high statistical heterogeneity for four of five pooled analyses; criteria for any cardiotoxic event differed between studies. Nonetheless the pattern of results was similar to those for clinical or subclinical cardiotoxicity described above. Evidence is not sufficiently robust to support clear evidence-based recommendations on different anthracycline treatment regimens, or for routine use of cardiac protective agents or liposomal formulations. There is a need to improve cardiac monitoring in oncology trials. Anthracyclines have been the key component of many cytotoxic regimens since their introduction in the 1960's and remain important in the treatment of many adult malignancies including breast cancer, sarcoma, lymphoma, and to a lesser extent, gynaecological cancer. In childhood cancers, anthracyclines are incorporated in more than 50% of regimens contributing to the overall survival rates in excess of 75%. For breast cancer long term survival is also greater than 70% across Europe . This is certainly at least partly due to the widespread adoption of adjuvant anthracycline based chemotherapy after surgery for early breast cancer to reduce the risk of relapse and death. For all cancers incidence increases with increasing age, therefore, increasing numbers of patients may have concomitant risk factors for cardiac disease at the time of diagnosis. In parallel, thresholds for offering treatment, including cytotoxic chemotherapy are becoming lower and survival is improving. This has resulted in more long term cancer survivors, including those who are cured and those with 'chronic' cancer requiring multiple drug interventions to control their disease. Longer survival highlights the importance of long term treatment related toxicity. Although paediatric malignancies are rare, the high cure rates achieved over the last two decades has highlighted the problems which may be encountered in adult life with relation to treatment induced late effects [2–4]. Anthracyclines are the drug class most closely associated with acute and late cardiac toxicity . It has been known since the 1970s that anthracycline treatment is associated with an increased risk of heart failure, and that this is dependent on cumulative dose and schedule . While the anti-cancer effects of anthracyclines are mediated primarily through inhibition of DNA synthesis, transcription and replication, they also generate oxygen-derived free radicals using iron as a co-factor and the mitochondrial respiratory chain. These free radicals cause direct damage to proteins, lipids and DNA and most available evidence suggests that myocyte apoptosis is related to increased oxidative stress caused by these processes . However, cardiac myocytes do not increase in overall numbers after the postnatal period. Young adults have a mean of 8.2 billion myocyte nuclei , but around 52 million (0.6%) are lost each year, resulting in a 35% reduction in myocyte numbers during adult life. Ventricular wall thickness is maintained by increasing myocyte volume (110 μm3/year), but nevertheless there is an overall loss of ventricular mass of 0.9 g/year. With their very limited capacity for mitosis, any additional loss of myocytes will result in a permanent reduction in myocyte numbers, an increased reliance on adaptive mechanisms and increasing vulnerability during normal age-dependent cell loss. Many reviews of cardiotoxicity of chemotherapeutic agents have been published. However, these tend to have a very broad scope and cover many different agents and tend to be opinion pieces which may be biased in their selection and presentation of study results [5, 9–11]. Several systematic reviews of the topic area have been published. These have a very specific focus on a particular type of cancer  or focus just on children [13, 14]. Previous systematic reviews of anthracyclines and cardiotoxicity in adults have been conducted [15–17], however, they have a narrower focus than our review, and do not include detailed information on how cardiotoxicity outcomes were defined and measured. In addition, several relevant studies have since been published. The primary purpose of this review is to systemically analyze all available data from RCTs on the cardiac effects of anthracycline treatment for cancer in adults and children. To critically evaluate the cardiac risks associated with anthracyclines, and to demonstrate the current gaps in knowledge. This will facilitate design of future prospective studies collecting long-term data, and will allow accurate estimation of the lifetime risks and benefits of anthracycline treatment. In addition this review may inform long term surveillance programmes for those receiving anthracyclines. This systematic review was conducted according to a protocol based on published guidelines , available from the corresponding author upon request, and is reported according to the recent PRISMA guidelines  (see Additional file 1). Searches were conducted of Medline, EMBASE and the Cochrane Library in June 2008 using a combination of free text and thesaurus terms for individual anthracycline agents combined with terms for different tumour types, cardiotoxicity and randomised controlled trials (RCTs) (see Additional file 2). Additional studies were identified by screening reference lists of identified studies and reviews. Abstracts and posters were included only if they were reported in sufficient detail to enable full data extraction. Studies published in any language were eligible. Non-published articles were not sought. Adults and children treated with an anthracycline for breast or ovarian cancer, sarcoma, non-Hodgkin's or Hodgkin's lymphoma and myeloma. The rationale for choosing these cancers was that they would be likely to have long-term survivors, and thus longer follow up on other important outcomes also. We excluded studies on participants with leukaemia due to the use of multiple chemotherapy agents known to cause cardiotoxicity confounding interpretation of results, and studies of lung and gastrointestinal (GI) cancers as they also have confounding factors with treatment coupled with poor long term outcomes making interpretation of results difficult. Anthracyclines reviewed were: doxorubicin, epirubicin, daunorubicin and idarubicin. Mitoxantrone was included if it was compared with another anthracycline. RCTs comparing any anthracycline agent with another anthracycline agent in liposomal or non-liposomal formulation, or another non-anthracycline containing chemotherapy regimen were included. If chemotherapy regimens consisted of multiple agents, the treatment arms under comparison could only differ in the presence or absence of an anthracycline or type of anthracycline such that the other therapies being compared were the same between groups. Studies comparing an anthracycline in addition to a cardioprotective agent if compared with an anthracycline on its own were also included. All standard dosing regimens were included; we excluded high dose regimens. Any treatment duration was considered. Any cardiotoxicity outcome including clinical and subclinical dysfunction was eligible for inclusion. We included cardiotoxicity evaluated using symptom checklists such as World Health Organisation (WHO) Common Toxicity Criteria (CTC) or New York Health Association (NYHA), cardiac function evaluated using MUGA scans and echocardiography and histological abnormalities by biopsy reported as Billingham scores. Both early and late cardiotoxicity were evaluated. We defined early toxicity as effects incurred during treatment or up to one year following treatment, and late toxicity as effects that occurred at least one year after treatment completion. Two reviewers (LAS and VC) independently assessed whether individual studies met the inclusion criteria. Disagreements were resolved by discussion with co-authors. Reviewers were not blinded to the identities of the authors or institutions of the articles as this has not consistently been shown to affect the process (ref handbook). Data from each trial report were recorded on a spreadsheet by one reviewer and checked by a second reviewer. For cardiotoxicity outcomes we recorded how they were defined, how they were evaluated, when they occurred (early or late) and whether they occurred on or off treatment. Where the timeframe for the outcome was not explicitly reported, we inferred this from average length of follow up in the trial. We used data for the intention-to-treat (ITT) population as defined by the authors of each study. Each study was critically appraised for methodological quality using recognised criteria . The reported design and conduct of each study were judged for four components that may introduce bias: method of generation of the random allocation, concealment of allocation at randomisation, blinding of trial participants and investigators, completeness of treatment and follow-up. We categorised outcomes as clinical cardiotoxicity if the outcome was explicitly reported as congestive heart failure (CHF), and subclinical if the outcome was reported as a reduction in left ventricular ejection fraction (LVEF) or other abnormality in cardiac function determined using a diagnostic test. For outcomes not explicitly defined e.g. 'cardiotoxic event' we categorised them as a mixture of both clinical and subclinical. If sufficient data were available, summary estimates of treatment effects were produced using meta-analysis for each set of treatment comparisons. When the outcome was rare in one or more studies (< 3 events in each treatment arm or < 1% event rate) a Peto odds ratio (OR) fixed effects model was used for the meta-analysis which has been show to be the least biased method, and is a good approximation of the relative risk (RR) when the outcome is rare . For outcomes that occurred more frequently, RR estimates were calculated and pooled using DerSimonian and Laird methods . The I2 was calculated to report the extent of heterogeneity detected . The I2 describes the proportion of statistical variability between studies in a meta-analysis that is greater than would be expected due to chance. Values in the region of 50% indicate moderate heterogeneity, and greater than 75% is considered substantial heterogeneity. Analyses were undertaken using the Stata V10.0 metan macro. Searches of electronic data bases identified 3,480 potentially relevant studies. After screening titles and abstracts, 277 full text reports were obtained and a further 15 studies were identified from reference lists of retrieved articles. Of these 292 articles, 55 RCTs met our inclusion criteria (Figure 1). The 237 articles excluded are listed in Additional file 3; Table S1. 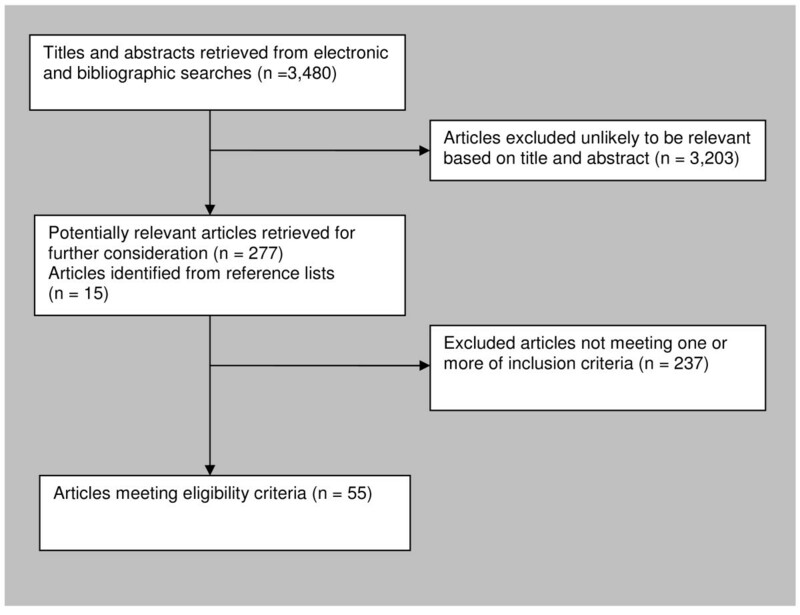 Results of literature search and selection of randomised controlled trials for systematic review. The majority of the studies were on women with advanced or metastatic breast cancer. Twenty-one studies included participants with myeloma, lymphoma, sarcoma or ovarian cancer, and three studies included a mixture of tumour types (Additional file 4; Table S2). Most studies specifically excluded patients with existing cardiac dysfunction; nonetheless, some patients had risk factors for poorer cardiac outcomes. These were mainly due to prior treatment with an anthracycline or radiotherapy. Nine studies specifically reported how many participants had radiotherapy to the chest - none reported if it had been delivered to the left side of the chest (Additional file 5; Table S3). Some (n = 22) studies specifically recruited patients with no prior anthracycline treatment, fewer (n = 11) recruited patients that were treatment naive. These tended to be the studies on people with lymphoma and osteosarcoma (Additional file 4; Table S2). Few pediatric studies (n = 4) met the inclusion criteria as the majority of cardiotoxicity studies have been performed on children with acute leukaemia . The quality of the included trials was variable ranging from poor to high quality. Common limitations included: insufficient details to adequately assess fidelity of randomization, lack of blinding of outcome assessors, cardiotoxicity outcomes only reported in sub-sets of patients - not the whole randomised sample, and inadequate assessment and reporting of cardiotoxicity results, particularly in studies were this was not a primary endpoint. Definitions used for different cardiotoxicity outcomes varied from one study to another, the definition used was not always reported and the time point when outcomes occurred was not always clear (Additional file 6; Table S4 a-f). In addition, sample sizes were often too small to provide reliable estimates of relatively rare adverse events such as CHF and cardiac related death. Eight studies compared an anthracycline with a non-anthracycline in women with breast cancer [24–27], ovarian cancer , children with lymphoma [29, 30] and adults and children with osteosarcoma . Treatment regimens varied across studies, and doxorubicin, epirubicin or daunomycin were given with other chemotherapy agents. Cardiotoxicity outcomes occurred early and on treatment [24, 27, 28]; late and off treatment [26, 29, 30], and some may have occurred late and off treatment [25, 31]. Three studies reported the incidence of CHF, and one study reported discontinuation due to reduction is LVEF. We made a post-hoc decision to categorise the discontinuation due to reduction in LVEF as a clinical cardiotoxic event due to the implied harm being greater than for a reduction in LVEF alone (sub-clinical). An anthracycline containing regimen increased the risk of clinical cardiotoxicity -OR 5.43 (95% confidence interval (CI): 2.34, 12.62; p < 0.0001; I2 = 0%); and subclinical cardiotoxicity OR 6.25 (95% CI: 2.58, 15.13; p < 0.0001). For any cardiotoxic event (clinical and sub-clinical) the pooled result is highly dependent on the choice of summary statistic; the Peto OR showed a significant increase in odds of cardiotoxicity with anthracycline compared with non-anthracycline: 2.27 (95% CI: 1.50, 3.43, p < 0.0001), whereas, the RR while higher, was not statistically significant, 4.23 (95% CI: 0.93, 19.38; p = 0.08). One possible explanation for these differences in effects is due to the different definitions of a cardiotoxic event used in each study giving rise to substantial heterogeneity, I2 72.0% (Figures 2, 3 and 4). Clinical cardiotoxicity defined as incidence of CHF in RCTs comparing different treatment regimens. The open diamond represents the pooled Peto Odds Ratio and 95% confidence interval (CI) for each treatment comparison. I-squared represents the proportion of variability between studies in excess of that expected due to chance, and p = probability that differences between study estimates are due to chance. Sub clinical cardiotoxicity defined as reduction LVEF in RCTs comparing different treatment regimens. The open diamond represents the pooled Peto Odds Ratio and 95% CI for treatment comparisons 1-4, and relative risk (RR) with 95% CI for comparisons 5-7. I-squared represents the proportion of variability between studies in excess of that expected due to chance, and p = probability that the differences between study estimates are due to chance. Clinical and subclinical cardiotoxicity in RCTs where cardiotoxicity outcomes could not be categorised as one or the other. The open diamond represents the pooled Peto Odds Ratio and 95% CI for treatment comparisons 1, 2 and 4, and relative risk (RR) with 95% CI for comparisons 5-7. I-squared represents the proportion of variability between studies in excess of that expected due to chance, and p = probability that differences between study estimates are due to chance. 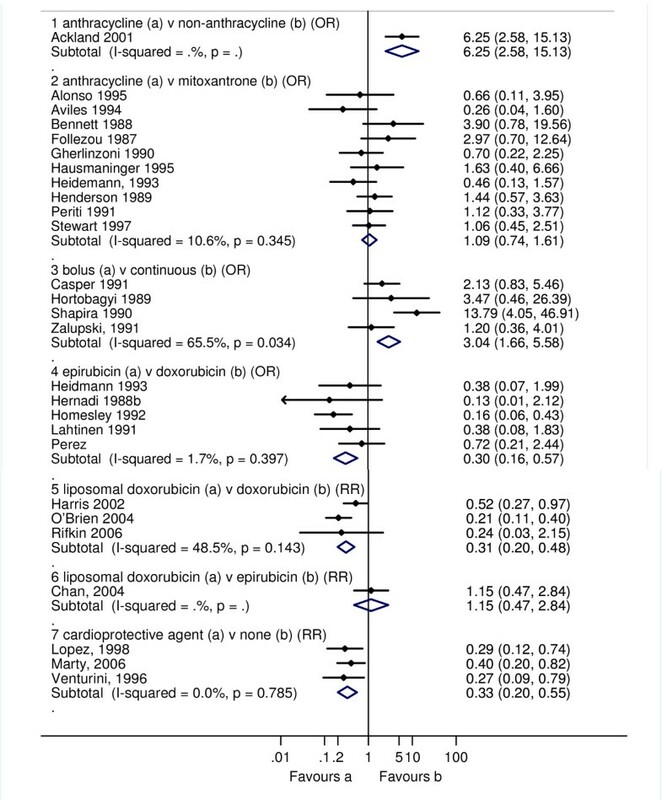 Meta-analysis of four studies showed cardiac related deaths, though infrequent, were significantly higher with an anthracycline OR 4.94 (95% CI: 1.23, 19.87; p = 0.025; I2 = 19.3%). Fifteen studies compared an anthracycline with mitoxantrone in women with advanced or metastatic breast cancer [32–42], multiple myeloma , non-Hodgkin's lymphoma , Hodgkin's lymphoma and lymphoma [45, 46]. Treatment regimens varied across studies and doxorubicin or epirubicin were given either as single agents or with other chemotherapy agents. Cardiotoxicity outcomes occurred early and on treatment [39, 41]; in the remaining studies it was unclear when the cardiotoxicity outcomes occurred and may include both early and late outcomes. An anthracycline containing regimen increased the risk of clinical cardiotoxicity OR 2.88 (95% CI: 1.29, 6.44; p = 0.01; I2 = 0%) compared with a chemotherapy regimen containing mitoxantrone. There was little difference between the treatment groups for subclinical cardiotoxicity, and for any cardiotoxic event (clinical and sub-clinical): OR 1.09 (95% CI: 0.74, 1.61; p = 0.673; I2 = 10.6%) and OR 1.31 (0.57, 3.03; p = 0.521; I2 = 0%), respectively. Cardiac related deaths were reported by only one study in one patient in the doxorubicin group (Figures 2, 3 and 4). Four RCTs compared bolus with a continuous infusion in women with advanced or metastatic breast and breast or ovarian cancer [47, 48], and adults with recurrent or metastatic soft tissue sarcoma [49, 50]. One study included participants previously treated with an anthracycline with unspecified cardiac risk factors in 10/25 (40%) and 15/25 (60%) of women in bolus and continuous groups, respectively . Patients with known cardiac problems were excluded from the other studies. Duration of continuous infusion schedules were: 6, 48, 72 and 96 hours; cumulative doses of anthracyclines received are shown in Additional file 4; Table S2. 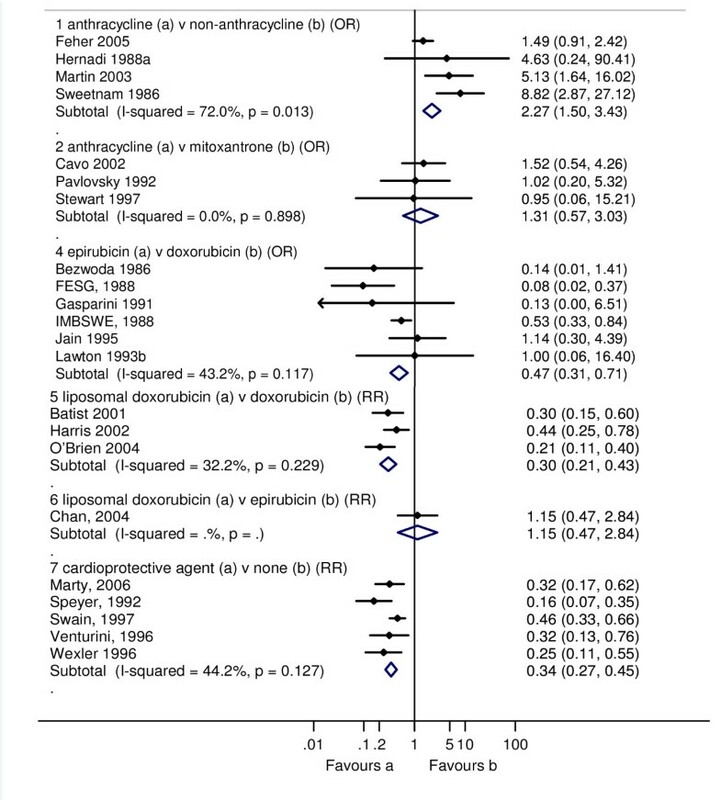 Cardiotoxicity outcomes reported in the RCTs are shown in Additional file 6; Table S4. It was not clear when the outcomes occurred in one study , and it is possible some events could be classified as late as median follow-up was five years; for the other studies outcomes occurred early and on treatment. Epirubicin or doxorubicin given as a bolus significantly increased the risk of clinical cardiotoxicity, OR 4.13 (1.75, 9.72; p = 0.001; I2 = 0%), and subclinical cardiotoxicity OR 3.04 (1.66, 5.58; p < 0.0001; I2 = 65.5%), compared with continuous infusion (Figures 2, 3 and 4). For subclinical cardiotoxicity the pooled result was highly dependent on the choice of summary statistic - random effects RR 1.93 (95% CI: 0.84, 4.44). One possible explanation for the difference in the effect estimates is the different definition for LVEF reduction used in each study giving rise to substantial heterogeneity. Cardiac related deaths were infrequent in either treatment group in two studies (Additional file 6; Table S4). There were no significant differences in response rates, remission or survival among patients in each study according to treatment group. Thirteen studies compared doxorubicin with epirubicin. The majority of the studies were on women with advanced or metastatic breast cancer [38, 40, 51–57], three were on women with ovarian cancer [28, 58, 59], and one studied patients with non-Hodgkin's lymphoma . Some participants had cardiac risk factors at baseline, mainly due to prior treatment with an anthracycline or radiotherapy (Additional file 6; Table S4). Cardiotoxicity outcomes reported in the studies are shown in Additional file 6; Table S4. Outcomes occurred early and on treatment in five studies; in the remaining it was not clear when they occurred and it is possible some events could be classified as late cardiotoxicity as follow-up was greater than one year. Epirubicin significantly decreased the risk of clinical cardiotoxicity OR 0.39 (0.20, 0.78; p = 0.008; I2 = 0.5%), subclinical cardiotoxicity OR 0.30 (0.16, 0.57; p < 0.0001; I2 = 1.7%) and any cardiotoxic event (clinical and sub-clinical) OR 0.47 (0.31, 0.71; p < 0.0001; I2 = 43.2%) compared with doxorubicin (Figures 2, 3 and 4). Cardiac related deaths were infrequent in either treatment group. There was no evidence of a difference in tumour response rate or survival between epirubicin and doxorubicin. Four studies compared liposomal doxorubicin with conventional doxorubicin in women with metastatic breast cancer [61–63], and in men and women with multiple myeloma . In the study of previously untreated patients with multiple myeloma, cardiac risk factors were absent. In two of the studies some women had cardiac dysfunction at baseline and in one, cardiac dysfunction was absent at baseline, however, risk factors due to prior treatment with chemotherapy and/or radiotherapy were present in some of the participants (Additional file 5; Table S3). One study compared liposomal doxorubicin with epirubicin in women with metastatic breast cancer . Women had no cardiac dysfunction at baseline; however risk factors for cardiac dysfunction were present in some women due to prior radiotherapy to the chest and prior chemotherapy (Additional file 5; Table S3). The cardiotoxicity outcomes occurred early and on treatment (2 studies); in the others it was not clear when they occurred and it is possible some events could be classified as late (3 studies). Liposomal doxorubicin compared with conventional doxorubicin decreased the risk of clinical cardiotoxicity OR 0.18 (0.08, 0.38; p < 0.0001; I2 = 0%), subclinical cardiotoxicity RR 0.31 (0.20, 0.48; p < 0.0001; I2 = 48.5%) and any cardiotoxic event (clinical and sub-clinical) RR 0.30 (0.21, 0.43; p < 0.0001; I2 = 32.2%). There was little difference between liposomal doxorubicin and epirubicin for subclinical cardiotoxicity, and any cardiotoxic event RR 1.15 (0.47, 2.84; p = 0.754); no cases of CHF were reported in either group (Figure 2, 3 and 4). Cardiac related deaths were infrequent in any treatment group. There was no evidence that suggests a difference in tumour response rate or survival between liposomal doxorubicin and doxorubicin, and whilst time to treatment failure and time to disease progression were significantly longer with liposomal doxorubicin than with epirubicin at equimolar concentrations, survival was comparable. One study each of doxorubicin  and epidoxorubicin  compared with idarubicin found little difference in risk of any cardiotoxic event (clinical and sub-clinical) with comparable therapeutic efficacy in patients with non-Hodgkin's lymphoma. Six RCTs evaluated the cardioprotective agent dexrazoxane; four on women with advanced breast cancer [68–71], one on young people aged no more than 25 years with sarcoma , and one with adults with breast cancer or sarcoma [72, 73]. The ratio of dexrazoxane to anthracycline varied between studies from 10:1 to 20:1. Cumulative doses of anthracyclines received were similar between randomised groups (Additional file 4; Table S2). Risk factors for cardiotoxicity were present in some participants, largely due to prior treatment with either anthracyclines or radiotherapy to the chest area; none had cardiac dysfunction at baseline, (Additional file 5; Table S3). For two of the studies outcomes occurred early and on treatment; in the other four studies it was not clear when the outcomes occurred. Dexrazoxane given either with doxorubicin or epirubicin significantly reduced the risk of clinical cardiotoxicity OR 0.21 (0.13, 0.33; p < 0.0001; I2 = 0%), subclinical cardiotoxicity RR 0.33 (0.20, 0.55; p < 0.0001; I2 = 0%) and any cardiotoxic event (clinical and sub-clinical) RR 0.34 (0.27, 0.45; p < 0.0001; I2 = 44.2%) compared with doxorubicin or epirubicin with no cardioprotective agent. Cardiac related deaths were infrequent in either treatment group (Figure 2, 3 and 4). Meta-analysis of two studies showed no significant difference between groups, OR 0.39 (95% CI: 0.05, 2.76; p = 0.343). For carvedilol , L-cartinine , prenylamine , amifostine  and acetylcysteine  there was only one RCT for each agent. No significant differences in cardiotoxic outcomes were detected between treatment groups. 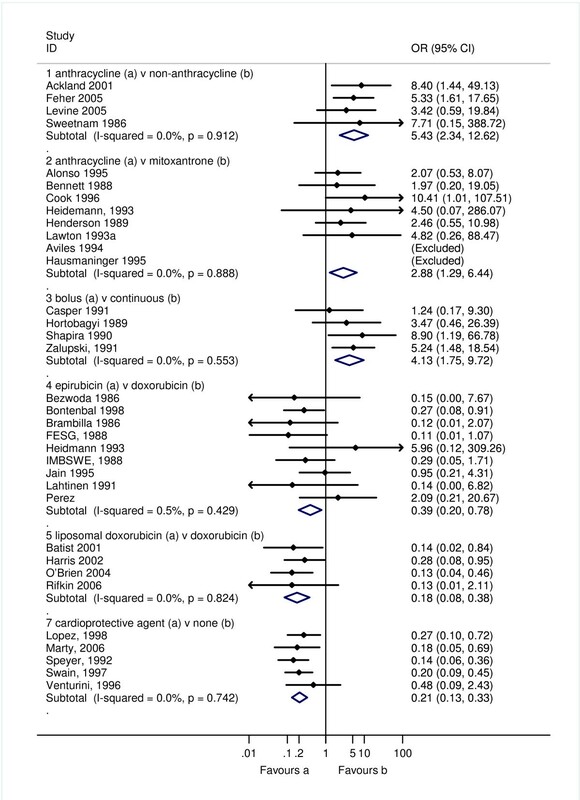 Additional outcomes not suitable for meta-analysis are shown in (Additional file 6; Table S4. The potential modifying effect of specific risk factors for cardiac outcomes at baseline remains an unanswered question in these RCTs. The presence or absence of specific risk factors was not consistently reported, and were not always balanced between treatment arms in the trials, potentially affecting results. We were unable to investigate the impact of specific risk factors as data were not reported separately for patients with and without specific characteristics. Generally there were insufficient studies in each pooled analyses to conduct meaningful subgroup analyses of different groups of trials according to the presence or absence of a specific risk factor such as prior anthracycline use or radiotherapy treatment. Our analyses demonstrate that anthracyclines increased the risk of clinical cardiotoxicity by 5.43 fold, subclinical cardiotoxicity by 6.25 fold, any cardiotoxicity by 2.27 fold and the risk of cardiac death by 4.94 fold compared with non-anthracycline regimens. For clinical cardiotoxicity, the risk was 4.13 fold higher with bolus administration compared to continuous infusion, and was 61% lower with epirubicin compared to doxorubicin. The risk was also 22% lower with liposomal doxorubicin, which allows a more favourable tumour to normal tissue concentration ratio. Risk was also 79% lower with the use of the cardioprotective agent dexrazoxane, which is an iron chelating agent and is thought to decrease the cardiotoxic effect of doxorubicin through preventing free radical formation . These data however do not allow us to comment on the absolute risks of early or late cardiac events after anthracyclines from this heterogeneous group of patients. Despite an extensive literature search only 55 out of the 292 papers for which full text articles were obtained were eligible for this review. This reflects the focus of most oncology research on cause specific outcomes in relation to cancer, and only acute outcomes in relation to toxicity. The majority of the 55 included papers were on women with advanced breast cancer. As many of the risk factors for breast cancer are common to cardiovascular disease, the fact that breast cancer is numerically the largest group in this review may bias the results towards overestimating the cardiac risks, unless other competing co-morbidities are fully controlled for. Many patients with breast cancer had received prior chemotherapy, and only some patients with sarcoma, lymphoma and paediatric malignancy were treatment naïve. Within the breast cancer population, some patients had cardiac risk factors, of particular concern; the impact of left sided chest wall radiotherapy could not be assessed. The quality of the papers in terms of determining cardiac outcome was variable and confounded by sample sizes which are inadequate to accurately estimate rare outcomes such as cardiotoxicity. Further limitations included the fact that they were reported only in subsets of participants in some studies, lack of common definitions for cardiac outcomes, and lack of common monitoring either in terms of modality to assess cardiac outcome or in terms of timing and duration of monitoring. This highlights the limitations of CTC reporting from a cardiology perspective. A previous systematic review of RCTs and cohort studies in patients aged less than 18 years at cancer diagnosis has also addressed anthracycline cardiotoxicity . Only four RCTs were identified, and the same methodological problems were encountered as in our review. Bryant and colleagues found dexrazoxane was noted to offset toxicity, but there was no benefit to longer infusion times in patients receiving moderate doses of anthracyclines. A large observational study of cardiac complication rates of women aged 66 to 80 years old receiving adjuvant anthracyclines using the Surveillance, Epidemiology and End Results (SEER) database has been conducted . A total of 43,338 women were identified, of whom 4,712 received adjuvant anthracyclines, and 3,012 women non-anthracycline containing regimens. For women aged 66 - 70 years at diagnosis, at 10 years post treatment, 29% of women who had no chemotherapy had been diagnosed with CHF, compared with 32.5% and 38.4% for women who received non-anthracycline and anthracycline based chemotherapy, respectively. The rates were significantly higher for anthracycline regimens compared with non-anthracycline chemotherapy -adjusted hazard ratio (HR) 1.26 (95% CI: 1.12, 1.42). For women aged 71 - 80 years at diagnosis the risk of CHF was not statistically significant between the three groups, although the cumulative rates of CHF were higher than in younger women in all three groups. The similar rates of CHF in each group may be due to selection bias in the groups treated with adjuvant chemotherapy in this older age group, or reflect a less aggressive approach in those who did receive such treatment. The type of anthracycline used was not reported, but a previous report on a sub-set of the same data suggests that doxorubicin was used almost exclusively . The results from our review suggest that these results cannot be extrapolated to regimens where epirubicin was used, or to younger women as the SEER data include a sub-set of older patients who are at higher risk solely due to their age . However, the data do potentially reflect clinical practice more closely, in contrast with outcomes for the highly selected patients generally included in clinical trials. Recommendations are that the cumulative dose of anthracycline should not exceed 600 mg/m2 for doxorubicin and 900 mg/m2 for epirubicin. Our data indicate a lower risk with continuous infusions compared with bolus dosing, but in practice this would neither allow dose escalation nor be a practical strategy to minimize cardiotoxicity in 'at risk' groups. Other significant predictors of anthracycline associated cardiac toxicity include: pre-existing cardiovascular disease such as coronary artery disease, hypertension, peripheral vascular disease, and emphysema, diabetes, ethnicity, age [6, 80, 83, 84]. Treatment related factors are higher cumulative doses of anthracycline, associated mediastinal radiation therapy and combination chemotherapy (trastuzumab, cyclophoshphamide, etoposide, melphalan, paclitaxel, mitoxantrone, idarubicin) [6, 17, 84]. Longer duration of survival is also a risk factor for cardiac toxicity, emphasising the importance of monitoring for long term effects in the growing population of cancer survivors . This is borne out by paediatric studies indicating continuous deterioration of cardiac function for up to 15 - 30 years after treatment [4, 85]. The CTC require revision to align them with modern cardiology evidence and practice. Cardiac function should be measured, and risk factors for cardiac dysfunction addressed prior to cancer treatment with cardiac toxic medication such as anthracyclines. Markers of cardiac damage and repeat measurements of cardiac function should be undertaken at intervals appropriate to the regimen prescribed. Cardiac follow-up should be continued long enough to accurately define the risk of long-term toxicity. Primary care colleagues should be alerted to the risks of cardiotoxicity in their patients, and if identified encouraged to inform the oncologist. This should be complimented by regular audit. Only then will it be possible to accurately define the competing life-time risks of cancer and its treatment which is essential to determine the optimal regimen for an individual patient, especially when given in the adjuvant setting. Currently, cardiac monitoring primarily comprises measurement of LVEF with imaging techniques which have inherent limitations of inter-observer and inter-institution variation and of the late manifestation of ventricular dysfunction in the development of cardiac toxicity. The role of markers of cardiac damage or wall stress, such as cardiac troponins and natriuretic peptides, in predicting late cardiac effects and guiding treatment is being actively investigated in prospective research. Unfortunately, published data are not sufficiently robust to support clear evidence-based recommendations on different schedules of anthracyclines, or the routine use of cardiac protective agents or liposomal preparations in patients defined as at high risk for anthracycline cardiotoxicity, such as patients with known cardiac impairment and/or previous anthracycline exposure. Nonetheless, these approaches may have a role. An alternative strategy would be to avoid the use of anthracyclines in favour of newer cytotoxic drugs with equivalent efficacy, but a lower risk of cardiac effects. In breast cancer treatment this might be achieved by moving to taxane-based regimens which appear to have less cardiotoxicity in clinical trials. Currently, most taxane regimens also contain anthracyclines given either concurrently or sequentially, and further RCTs will be required to determine whether anthracyclines can be omitted without compromising efficacy, and that the anticipated reduction in late cardiac and other long-term adverse effects is observed. Although many risk factors for coronary artery disease are known, and some of these overlap with risk factors for anthracycline induced cardiotoxicity, much less is known about pharmacogenomic risk factors which are important in the pathogenesis of many drug side effects including those of anthracyclines ). This is a potentially important area for research. The cardiac effects of cancer treatment usually occur too late to allow dose-adjustment between cycles of chemotherapy, but if patients' individual susceptibilities could be defined in advance of chemotherapy, then prospective modification of regimens could be made not only to reduce anthracycline exposure in high risk individuals, but also possibly to safely allow higher exposure in individuals at low risk of toxicity. An unrestricted educational grant was provided to Medical Research Matters by Sanofi Aventis. The funders did not have any role in the design, collection, analysis and interpretation of data, writing the manuscript or approval of the manuscript for publication. All authors developed the protocol. LS and VC collected the data. VC conducted the analysis and interpreted the results in collaboration with PC, AJ, GL, CP, LS and MV. All authors drafted and critically revised the manuscript and approved the final version.